CTC Global ACCC® conductor offers twice the capacity of conventional all-aluminum or steel-reinforced conductor with far less thermal sag. ACCC runs cooler and more efficiently than any other conductor type of the same diameter and weight. Line losses are decreased under any operating condition—freeing up generation capacity assets to serve growing demand while reducing emissions. Do you need to increase the capacity of an existing line? Are you trying to reduce the upfront capital cost of a new line? Is grid reliability a concern? Ready to reduce your carbon footprint? Initially deployed in 2005, CTC Global’s high-capacity, high-efficiency, low-sag, patented and extensively tested ACCC® conductor has raised the performance bar over any other commercially available conductor on the market today. 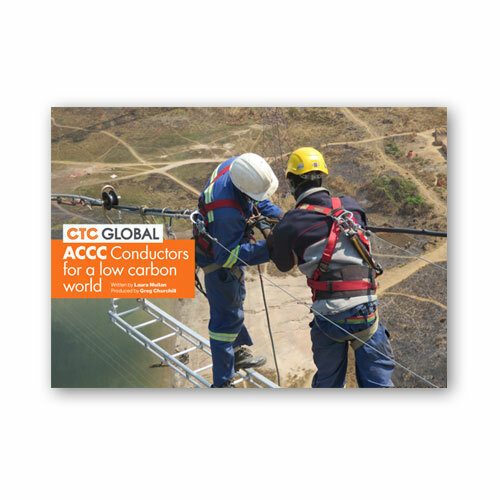 Deployed at over 650 projects in 50 countries, the high performance ACCC conductor is reliably delivering power to millions of residential, commercial and industrial customers, worldwide. The ACCC conductor’s hybrid carbon fiber core offers twice the strength of conventional steel reinforced conductors at a fraction of the weight. The reduced weight of the composite core and lower coefficient of thermal expansion allows the ACCC conductor to carry up to twice the current of conventional conductors while exhibiting 25 to 40 percent lower line losses under any given operating condition. Reduced line losses serve not only to reduce fuel consumption and associated emissions, it also frees up generation capacity that is otherwise wasted.